DMSAT1, the Environmental Satellite of Dubai Municipality, DM, is scheduled to be completed by the end of this year and will be launched in Q2 of 2019, Alia Abdul Rahim Al Harmoudi, Director of the Environment Department at the DM, said. "The manufacturing of the environmental satellite, which commenced in July 2017, is continuing as per schedule," Al Harmoudi announced during her presentation of the latest environmental monitoring systems in DM such as the DMSAT1 Environmental Satellite and the Mobile Environment Monitoring Station at the Dubai International Exhibition for Government Achievements. "It is one of the latest generations in the global satellite systems and represents an important step towards the future in the field of environmental monitoring. 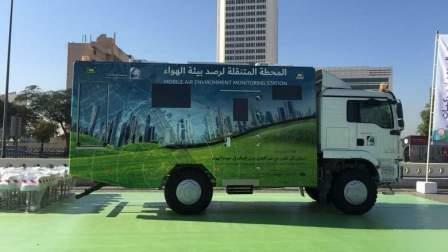 The Municipality has employed the latest environmental monitoring techniques to monitor the air pollutants and greenhouse gases causing the phenomenon. "Climate change is one of the most important environmental challenges facing the people across the world as it threatens the sustainability of ecosystems and natural resources on Earth as well as the health and safety of communities. This satellite provides a wide range of important and multipurpose data for environmental research and studies," she pointed out. The Nanometric Environmental Satellite has large features covering large areas of land and sea, especially as it orbits the Earth 14 times per day and re-observes the same monitoring site within five days, she said. "The satellite has the ability to provide spatial data for the monitoring process, even during sandstorms, which are value-added given the importance of obtaining such data in such circumstances," she said. As for the nature of the satellite's technical capabilities and the data it provides, she confirmed, "One of the most important usages of the environmental satellite is the monitoring and measurement of aerosols in the atmosphere." This type of data provided by the satellite is important in the environmental monitoring of the pollutants, emitted to the air and that threaten the health and safety of the community. It is also associated with the studies and research on the results of exhaust emissions of vehicles, marine devices, industrial sites and dust. Therefore, there is a high possibility of employing such data in the study and analysis of many environmental phenomena, including the phenomenon of the growth of moss and red tide, due to the ability of the satellite to cover large areas during the monitoring process, Al Harmoudi said in conclusion.